One up to the XPAGS! A small but very select group of cars took part in the first race for the new FISCAR FLIERS but it was not short of drama or action. Andrew Hibberd qualified the Buckler Mk6 but failed to take the start. Rodd Begbie, whose enquiry, 18 months ago, triggered the whole concept of this new series, rather appropriately, put his Elva Mk4 FWA on pole but only by 3 tenths from FISCAR stalwart, Brian Arculus, with his Lotus 9 FWA, who was in determined mood clearly intent on taking the fight to Rod. Qualifying third some 1.5 seconds off the pace was Alex Quattlebaum in his Leco Mk2 (1500 XPAG). He looked to be in for a lonely race as he was 2.5 seconds ahead of John-Paul Mason in Chris Guest’s Cooper T21 (1350cc XPAG). John Tewson qualified his (Class 3) Frogeye Sprite 5th, ahead of the misfiring OSCA 4MT of Tony Bailey. Mason, Tewson and Bailey in line astern - well almost - certainly in the order they qualified! The OSCA, temporarily fitted with a ‘cooking’ 1600cc Alfa Romeo engine whilst the racing 1500 engine is being rebuilt was the subject of feverish activity after qualifying and started the race firing on all cylinders and was to go better, for a while, at any rate. Andrew Hibberd qualified his Buckler MK6 (1172cc side valve) 7th but ‘something went bang’ as he entered the paddock after qualifying and was therefore sadly a non-starter. Last but certainly not least was David Lee’s wonderful Tojeiro JAP, driven by Clive Wilson. So, just 7 cars lined up for the final race of the day with the sun beginning to dip below the horizon creating a rather dramatic backdrop. As the cars left the line it looked as though the anticipated battle for the lead between the two 1100cc Coventry Climax cars would materialise. However, there was an interloper in the shape of the Leco Mk2 driven with verve by Alex Quattlebaum determined to make a mockery of qualifying and he not only clung on to the leaders but emerged in the lead at the end of the first lap with Rod Begbie in close attendance. Brian Arculus, taking a watching brief, was several car lengths back. Very disappointingly, Rod’s challenge ended on the second lap with a rear hub failure and he pulled the Elva up disconsolately, thankfully without hitting anything, but rueing the fact that it was a new component that had broken. This left Alex still leading from Brian, the Lotus looking as though it would be able to strike at any time. Jean-Paul Mason presses on in Chris Guest's Cooper T21 fitted with 1350cc XPAG to take a fine 3rd. Dropping back was John-Paul Mason in the very smart and crisp sounding Cooper T21 but nevertheless putting good distance between himself and Tony Bailey in the OSCA 4MT, now sounding absolutely on song. Tony was shadowed at a few car lengths by John Tewson’s Frogeye Sprite. The Tojeiro Jap sounded fantastic and although circulating last, Clive Wilson lapped fully 9 seconds quicker than his qualifying time before pulling into the pits at the end of the 5th lap with exhaust problems. It would be fair to point out at this stage that the car hadn’t raced for nearly 60 years! Meanwhile back at the front Alex established a 1.5 second lead over Brian at the end of lap 3 but the Lotus man responded by closing back in and the gap steadied for the next few laps to under a second. Jean-Paul circulated the Cooper quickly and consistently in an increasingly isolated 3rd place whilst the OSCA had started to misfire which enabled the Frogeye to begin to close slowly but relentlessly in. So with just 5 cars left in the race, we nevertheless had two battles in play to entertain those few spectators who had stayed to watch the last race of the day. On lap 7, John Tewson took the Frogeye ahead of the OSCA to take 4th place and started to ease away, his lap times an absolute model of consistency whilst those of the OSCA continued to drop off as the misfire increasingly set in, but Tony Bailey was determined to bring the Italian car to the flag,&nbsp; and finish he did. At the front Brian Arculus looked comfortable stalking the Leco but never seemed quite close enough to strike until lap 8 when the deficit was down to 3 tenths and on lap 9, Brian pounced and headed Alex by 6 tenths at the end of it and extended the lead to almost a second by the end of lap 10. It looked certain that the Lotus had the race, but looks can be deceptive and with the low sun making visibility difficult in certain sections of the circuit, the Leco stayed close to the Lotus and Alex, with what Marcus Pye, commentating, described as a ‘demon pass at Quarry’ retook the lead on lap 13 and held it to the flag. It was fitting result for the man who had flown in specially from the States to support this race, and I doubt even Brian Arculus, despite having already incurred the disappointment of a non-finish in the Elite in our Inter-Marque race, would begrudge Alex Quattlebaum his fine victory. Alex Quattlebaum driving the Leco Mk2 to a fine victory in the first FISCAR FLIERS race. Whilst it was a small grid, the seed has been sown. I am optimistic that we can now grow the grids for these great and historically interesting little sports racers, so watch this space. 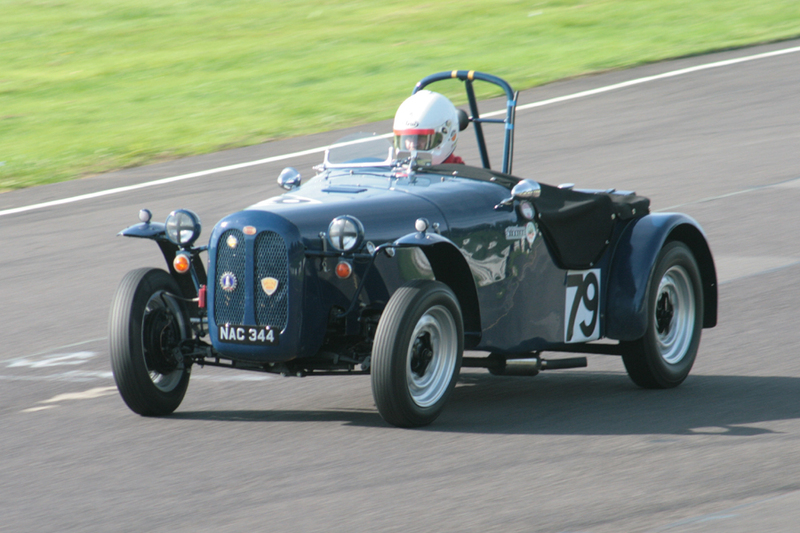 It remains for me to thank all those that helped make this race happen, Castle Combe race circuit, my fellow FLIER committee members – Peter Morley, Rod Begbie and Brian Arculus, and above all, those who entered and/or drove this first race. There are surely many more out there who will now wish to follow in their footsteps, so please register your interest with us. &nbsp;Please also check out both our FLIERS for sale list and the FLIERS gallery to see the exciting potential this has for the owners of these small historic racers.